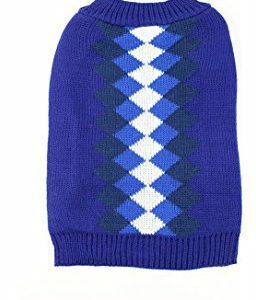 Once you put this Chilly Dog Vintage Ski Hoodie Dog Sweater on your friend, your dog will be ready for a romp in the snow. 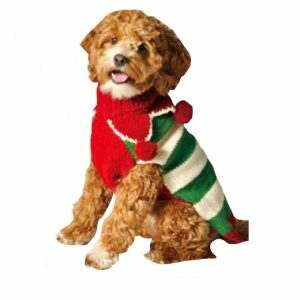 This classic sweater is handmade with a cheery rainbow stripe pattern with an adorable red hood topped off with a pompom. Once you put this Chilly Dog Vintage Ski Hoodie Dog Sweater on your friend, your dog will be ready for a romp in the snow. 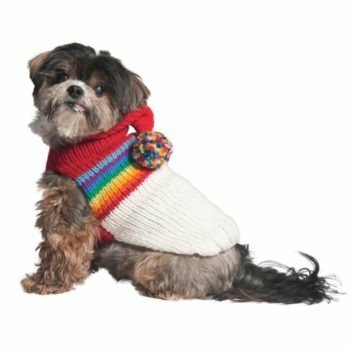 This classic sweater is handmade with a cheery rainbow stripe pattern with an adorable red hood topped off with a pompom. It is knit from 100% wool making it a very warm sweater to have on during those cold mornings or nights. The Chilly Dog Vintage Ski Hoodie Dog Sweater is available in sizes small, medium, and large.